Large 65mm diameter chair caster rolls more easily than smaller standard chair casters. Available with hard tread for carpeted floors or soft tread for hardwood and tile floors. 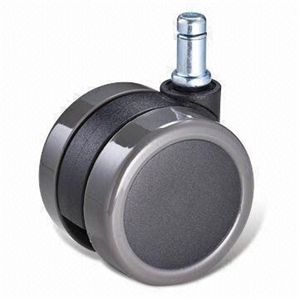 Large diameter chair caster rolls more easily and is more durable than common chair casters. Available with hard tread for carpeted floors or soft tread for hardwood and tile floors. Large 65 mm (2.56") wheel-diameter rolls easier than the smaller casters sold on most office chairs. Sturdy 135 lb. load capacity per caster. Note: Installed height is 2.56", which is taller than a conventional chair caster. Please be aware that this may raise the height of your chair.